The UK's seaside towns are well past their heyday and will never go back to the way they were, but some are making a comeback under a different guise. Tales of packed esplanades, beaches you couldn't move on, and queues of groaning ferries waiting to disgorge holidaymakers into guesthouses and campsites are long gone. But while some places have withered on the vine, many are reinventing themselves to grab their share of a general growth in domestic tourism. Those towns trying to find, or rediscover, their niche have had a myriad of barriers to contend with, not least being in competition with a whole planet that has become more and more accessible to the travelling public. But it could be argued that their biggest problem has been challenging perceptions. Say the words "British seaside resort" to marketing expert Jonathan Gabay and he conjures up a list of pretty devastating words: rain; dreary; dull; grey seas; bacon sandwiches; B&Bs; stony beaches. Thank goodness he's not on the marketing team for British tourism, you might think. But the point he is making is that those are just his perceptions. If he was given the job of altering similar perceptions in others, what would he do? "Marketing is not about just giving things nice logos and slogans - in this case it would be about focusing on the feelings that are conjured up once you have actually been to one of those places." In other words, any rebranding guru worth their sea salt would be taking the typical UK resort town and finding its ESP (Emotional Selling Point). "Holidays are about feelings, for example about getting away from work, spending time with your loved ones, relaxing, having a laugh," said Mr Gabay. "We want to show people what they are going on holiday for. Once we start exploring ESPs, we quickly realise those grey seas are not what we thought they were." While he would be wary of advising any resort to try to sell their "uniqueness" (Britons are too cynical to believe anything is truly unique, he says) the next tactic is to hone in on its PoD (Point of Difference). "Once you've got it you want to focus on it, bring it out." In Lyme Regis, for example, tourists these days are falling over themselves to find dinosaur fossils on the beaches. The Jurassic coast - a World Heritage Site straddling Dorset and East Devon - is one example of how an area rediscovered its PoD. Exploiting nearly 200 million years of history could hardly be seen as a whacky new idea, but it's how it's marketed that counts. "It doesn't matter whether it's prehistoric or not, it's about how people will feel when they do something like that, and what they'll get out of it," adds Mr Gabay. Many seaside towns are going back to their natural, historical and cultural roots to cater for new holiday tastes and trends. Others are leaning towards new innovations. In the Victorian island resort of Rothesay, on the Isle of Bute, the community realised it had been ignoring the beauty and heritage of the island as a whole, while the resort town slowly faded into decline. Instead of trying to drag back the traditional crowd it is now marketing itself to outdoorsy walkers, cyclists and sailing enthusiasts who appreciate culture, good food and scenery. It is a more modern marketing ploy to concentrate on a particular niche market, group or experience, rather than to promote a certain attraction, said Visit Britain spokesman Elliott Frisby. And regeneration isn't all about buildings and infrastructure either - in the last 15 years there has been a "quiet revolution" in terms of the quality of food on offer in UK resorts, and the tourism sector has been raising its customer service game to compete with the rest of the world, he added. "It's about what seaside experience we are offering," he said. Bournemouth, in Dorset, has its eye on the "stockbroker surfer" market - 30+ professionals with money for expensive hobbies. To reel them in it has plans under way to construct an artificial surf reef at Boscombe - the first in Europe. Scarborough's "urban renaissance" is aiming to capture the funkiness of Brighton and the culture of St Ives, with its contemporary Tate gallery. Butlins knows its family market, but it has kept its eye on the ever-changing demands of the young, with downloads rooms and facilities to burn their own pop CD. Plans for Hastings, which has suffered badly from deprivation and decline, talk of aspiring towards a more "European feel...to distinguish ourselves from some more parochial English towns". 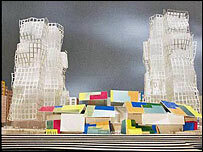 And the word "reinvention" cannot be uttered without reference to the proposed transformation of Hove's seafront, in Sussex - still under discussion - with its 21- and 25-storey asymmetrical towers, designed by architect Frank Gehry. But regeneration isn't always so drastic and doesn't have to be perceived as a slap in the face for nostalgia and seaside kitsch. 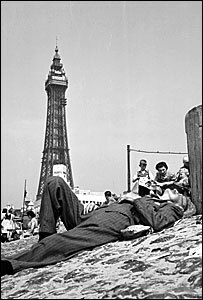 Photographer and author of The English Seaside, Peter Williams, says despite his largely nostalgic book being "upbeat" about the seaside he has no truck with modernisation. "I don't object to a bit of stainless steel coming in and replacing the Victorian balustrades. Not when they are trying to improve places." "Lots of places are trying to regenerate themselves. St Ives must be one of the top six destinations - the Tate has transformed it, although some say not in a good way. It's certainly awash with money. "But the bulk of visitors come from the caravan parks nearby, and say they are having trouble finding a fish-and-chip shop. It can be very expensive, some people feel it is not for them any more." While change may not be to everyone's liking, many believe the British seaside has no choice but to sink or swim.